Need a handy at-a-glance reference to keep track of all that’s going on at New Eagle? Good-to-Knows are for you! The PTO website is the ultimate hub of reference for all of the great events and activities hosted by the PTO, and we encourage families to regularly check the website for the latest information on what’s happening. But for a great at a glance reference to tack on your refrigerator or bulletin board, try printing a copy of our monthly Good-to-Knows! 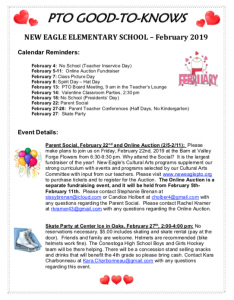 PTO Good-to-Knows are published just before the beginning of each month and contain all planned upcoming events for the month. Please note, some events are put together last-minute and may not be included on the Good-to-Know — we encourage you to still check the website and e-mail blasts often for all of the latest details and announcements! View or Print February’s Good-to-Know! Never miss an announcment - sign up for New Eagle PTO Email Blasts today!